Was excited to see a presentation by my friends Ron Friedmann and Tania Daniels over at Ron’s blog. There’s some good stuff in there, though when they got to “Who’s out there?”, I was surprised my former employer, Interface Software (er, that’s LexisNexis Interface Software. Or is it LexisNexisInterfaceSoftware? ), wasn’t on the list. When we launched InterAction 5 just about three years ago (in fact, the press tour was ending right about now), a considerable amount of the focus was on internal expertise; in fact, the subsequent release of the Matters module (no idea what it’s called these days) cemented InterAction’s ability to connect lawyers to their work product, reveal (automatically) who had what skills internally, and then use the resulting web of relationships to figure out who was right for the current project (both from a sales and a practice standpoint). Anyway, just an observation. Am I off base? If you live near DC (or would consider relocating), have strong technology management experience, and would enjoy using your expertise to fight for child hunger, workers’ rights, and other exciting projects, we want to hear from you. Write futures-at-echoditto-dot-com. Reporting directly to the Chief Operating Officer, and with minimal supervision, the CTO is responsible for all facets of EchoDitto’s technology operations, both internally and on external, client projects. S/he also leads the EchoDitto technical staff and ensures timely and on-budget completion of client deliverables. S/he leads EchoDitto and its client organizations on technology decisions, including: software platforms; third-party vendors; web-based technology and tools; and strategic direction. At my company, we’re looking at recapitalizing from 3.5 million shares to 35 million (and contemplating 350 million). … I asked my attorney what his recommendation is, but I’d love a second opinion. Do we stay at 3.5m, do we go to 35m, do we go to 350m? My general rule of thumb for a venture backed company is to try to establish a share base from the beginning so that you never have to do a forward or reverse stock split (referred to in the question as “recapitalizing from 3.5m shares to 35m shares – or a 10:1 split. )” A range of 10m to 50m shares – depending on what you think your exit value will be (the more optimistic you are, the more shares you should use) – is a good range to work with. Couple take-aways from this: first, the guy who e-mailed Brad out of the blue just got an insanely good amount of free advice. That’s a good lesson for anyone looking for input from a pro: sometimes, asking is all you need to do. Second, if you’re someone like Brad — sharing that info is very helpful to those of us in the trenches who don’t always see the various moving parts of the larger financing picture. Unlike the realtors that Levitt and Dubner write about in Freakonomics, Brad’s perfectly willing to be transparent with this kind of info — and it’s not just that he’s a nice guy: you don’t think other entrepreneurs are out there, looking at the number of financing options they have, and taking into account what kind of VC each individual is? Bottom line: if you’re an entrepreneur who wants to better understand how investors see your business, a subscription to Brad’s feed should be top on your list. Earlier today we announced that we’re implementing support for iTunes “really soon”; the specs behind Apple’s RSS extension are here. Dave notes that it leaves a bit to be desired, and Sam suggests that there’s some inconsistencies between the spec and the examples, which will make it hard to validate. It’s official, iTunes 4.9 is out and available for download. As widely discussed, it includes podcasting support — it works very easily, though it’s obvious that podcasters will want easier ways to categorize their podcasts. Apple’s podcast specifications are here, which includes specifics on Apple’s RSS extension for adding meta data about your podcast. Its ease of use is a big plus — this will dramatically increase the listenership of podcasts, which is most definitely a good thing. Someone at Gnomedex (sorry, can’t remember who) asked about pinging FeedBurner, so I dug up the answer. You can automatically ping FeedBurner (details are here) if your weblog application supports it; otherwise you can manually ping us using the “resync” feature in your account. One other thing I noticed: the unfortunately named john arrested on June 15: Howard Lovelady. I just started reading Freakonomics on the flight out; I’ll write up some observations on the plane tomorrow. This is pretty cool… Adam Curry is doing his concluding keynote as his 200th “Daily Source Code” live. Adam’s being very gracious, talking about a lot of the sources of inspiration that got podcasting to where it is today. Great discussion of where this is heading, why it’s important to get there. A fitting way to end a big couple of days. Buzz, Denise, and Jason are leading the discussion on legal issues relating to blogging and technology. I had lunch with Denise, who mentioned that Buzz was reinstalling Windows prior to the presentation (a bizarre pre-presentation ritual? ), but it looks like the machine got its issues straightened out, as they’re leading the presentation using MindManager. Jason explains his strategy when he’s sued: extend the conversation, force them to file a lawsuit. Buzz just responded that Jason’s a bit delusional on this point, that lawyers are more than happy to talk at $200/hour. The crowd’s certainly enjoying Jason (who’s pointed out how often he hangs up on lawyers). Another threatened lawsuit — the Amby debate over at BloggingBaby, where BloggingBaby reported on the claims of one parent (who alleged some product defects in a crib) and the reaction of the company (who denied the allegations and sent a cease and desist letter to Weblogs, Inc.
Denise points out that the EFF guide for bloggers is a good starting point for outlining the legal implications of blogging. So it turns out that yesterday’s connectivity problems were due in part to someone sending a live video feed from their laptop. Spotty wifi is conspiring to force all of us in the room to (gasp!) pay attention. I feel bad for Dave, whose demo requires net access… memo to conference planners: get the speakers a wire. Don’t make them dependent on the stability of the wifi connection. If ever there were a need for gender equality, it’s this conference. Just arrived at my hotel in Seattle for Gnomedex. On my flight out here, I realized this may be the first conference in at least a half dozen years where I’m here as an attendee, not as a speaker, a vendor or a sponsor. Ordinarily on the afternoon of arrival, I’m realizing how woefully under-prepared I am for whatever presentation it is I’m about to give — instead, I just get to schmooze, listen to the presentations and enjoy the time in Seattle. I imagine I’ll add some observations about the presentations tomorrow and Saturday, though it appears quite likely that it will be insanely over-blogged. The 300 attendees will no doubt be accused of group navel-gazing (“Look! The bloggers are blogging about bloggers talking about blogging!”) — which, given this photo of our eponymous host on the giveaways page should be plenty of cause for concern. In all seriousness, I’m excited about meeting a number of the attendees, several of whom I’ve “known” for years but haven’t had an opportunity to meet in person. Caught at /., Google has filed a patent application for its PageRank technology. Nothing necessarily shocking — slow and steady, get inbound links, don’t be evil kind of stuff — but very interesting to see it spelled out. 4,742 recorded lynchings in U.S. history. I have a Windows Media audio file (.wma) that I’d like to convert to MP3. Anyone have a simple way to do it? Once I have the conversion done, I’ll share the audio — it’s of a recent event that I think people will want to hear. 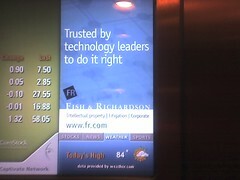 Fish & Richardson is advertising on the Captivate Network. Wonder if any other law firms are doing this? Certainly seems like a great idea: quick ads, captive audience, and almost guaranteed repeat viewings by your audience. (I’ve seen it at least a dozen times this week.) Smart. 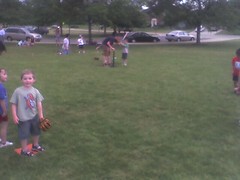 Yesterday was the first game (I’m an assistant coach), and the kids did really well. Of course, I nearly screamed myself hoarse as I implored the kids to “THROW IT TO FIRST!” which works fairly well, until you realize that you may as well tell the kids that last month’s jobs report was anemic. In other words, they don’t really grasp all the fundamentals of the game yet, so they don’t have much context for helpfully yelled directions. So we relaxed, and were thrilled to see the kids actually get three outs on the other team (the other team managed no outs). It’s a start! No, I’m not leaving FeedBurner… just some exciting news from the FeedBurner lair: now publishers can take their feeds with them. What does this mean? It means that if you publish a feed through FeedBurner and decide that we’re not the nice, fun-loving bunch you thought we were, we will not only let you go, we’ll let you redirect your FeedBurner feed back to your site. But seriously, don’t go. We’d miss you. I started planning the day before; I had invited Robin to my apartment for dinner where I would cook. I lived in France for a year in college, and in my travels I picked up a Paul Bocuse cookbook, which just happened to be in French. Since I was fluent, I didn’t think that would be much of an issue… so I pulled it out, eager to impress Robin on our first date. The recipe for chocolate mousse sounded great — espresso, rich chocolate — what a way to impress, right? One problem: when the recipe got the part with eggwhites where it talked about “blancs de neige”, I had no idea what the hell that meant. Snow? WTF? So I mixed the eggwhites (knowing nothing of what happens to eggwhites when they’re beaten long enough — specifically, they turn into a foamy substance that resembles snow peaks! Aha!) and got nowhere near where I was supposed to, but then, I didn’t know any better. Finished the recipe, put it in the fridge (where it’s supposed to chill for 24 hours) and the following night, continued with prep. Made spaghetti carbonara, a salad, opened a nice bottle of wine. Robin showed up with flowers (talk about role-reversal! ), and we proceeded to have a wonderful night. Great conversation, interesting stories, and none of the first-date jitters that I remember having on so many other occasions. When it came time for dessert, I could not have been more proud of myself: I had made dessert ahead of time. I pulled the dishes out of the fridge, placed them on the table, and explained the back story (I may have bragged, just a little). One swipe of the spoon through the “mousse” and it became obvious that what I’d made was more like Yoohoo… having not beaten the eggwhites anywhere near long enough, the mousse settled into a gelatinous chocolatey goo that was not at all edible. My ego shattered, I rescued Robin from having to eat any of it, and we instead sipped the wine and continued to talk. It was, in spite of my culinary incompetence, a wonderful evening. After we said goodnight, I remember lying on the couch listening to my CD player, certain that the night would change my life. Don’t ask me how, but I knew. Less than ten minutes after Robin left, the last song on the last disc on my 6 disc player played, and the room went silent. The next morning I was scheduled to leave to visit a former girlfriend — I called that morning and told her something came up, I couldn’t make it. I knew. Robin and I dated for the next 18 months, and were married a year later. But it all started ten years ago tonight. I’m a very lucky guy. Please, Howard, I beg you: build the party, let the Republican party marginalize itself. You’re doing us no favors with these repeated insults of our fellow Americans. A wise philosopher once said (or was it Ice-T?) “don’t hate the playa, hate the game.” In other words, focus on the impact of the Republican policies, not the Republicans (and if you’re going to target Republicans, focus on the elected officials, not the voters). We are both talking about the Republicans and their failure to address the needs of working people. We both agree with this basic truth: This Republican president and this Republican majority are not doing what they should be doing for working people in this country. That’s a core belief we need to fight for. And what’s more, we agree that we – all Democrats and all working people – should be complaining, criticizing, and generally speaking out about this critical failure of the Republican party and offering our positive vision for America. And we have. Howard and I have been saying the same thing about this for years. Hear that? The same thing. For years. Have I ever put it some way that Howard wouldn’t agree with? Probably. And he put it in a way, once, just the other day, that I can’t agree with, since I come from a place where hard-working people, who are better served by the agenda and passion of the Democrats, somehow still vote Republican. Nice. He goes on to do exactly what I had hoped someone would do, which is to articulate what Democrats are for, instead of simply demonizing the opposition. Well done. Seth Stevenson’s wrap-up of reader responses to his request for worst ad song ever used in a TV spot is priceless. There are too many great examples to list them all out, just drop by and enjoy the many examples he’s collected. Well, reporters read blogs. So do opposition researchers. In an era of online access to a lot of information about candidates, a stray comment by a candidate or political party on a blog can form the core of a pretty devastating 30-second television ad. Fundamentally, there is a conflict between what makes for a good blog and what makes for smart campaigning. … I’m in complete agreement that there is a segment of the voting population that can be reached through the web. The DPI does a poor job in this area. Just put me in the cautious category when it comes to free-wheeling blogging. The problem isn’t that this isn’t happening online, it’s that it’s not happening at all. The Illinois party isn’t doing this infrastructure-building offline either — I haven’t received a single piece of information from the state party, and I’ve been the chair of the local party for a year now. (In fairness, I received one phone call, after I called to ask about the sorry state of the website last summer.) Without that kind of operation, our ability to build a farm system of candidates from the most local of positions up to state-wide races is significantly hampered. There’s clearly a role for an online component of this strategy. Like Larry said, it’s neither the most prominent part of that strategy nor the most critical. But it is important, and could provide the foundation on which a more engaging, energizing state party could be built. Let’s hope. I got an e-mail the other day from a local Democrat, asking for my help in spreading the word about a movement to ask Rep. Judy Biggert to remove herself from the House ethics committee. Rep. Biggert is my representative (IL-13), and she’s a Republican. She serves on the Ethics committee (the same one that is responsible for what to do with Tom DeLay). As it turns out, Rep. Biggert took some money (about $1800) from DeLay’s PAC 7 years ago. In other words, this group expects Biggert to step aside because of a one-time contribution of less than $2,000 — this for a candidate who’s raised nearly $2m over the past six years. Keep in mind that the committee she sits on did in fact censure DeLay three times last cycle… they didn’t go far enough, of course, but isn’t it stretching credibility more than a little bit to think that $1800 has any influence for a candidate who regularly raises over a half million dollars per cycle? In case it wasn’t obvious, I passed on the opportunity to help this individual spread the word. Quite rightly, several Democrats (including Joe Biden and John Edwards) criticized Dean’s remarks, suggesting that his remarks don’t speak for a majority of Democrats. Back in November when I indicated I was excited about the prospects of Dean as chair (and agaain in February when he was elected), I indicated that I was most interested in the fact that he realized we had to build the party from the ground up, even in the areas where that would be a long-term commitment without any likelihood of short-term gains. The early fundraising indicators aren’t positive, with the DNC fundraising lagging behind the RNC — and this was an area where Dean was supposed to excel! Helping the party articulate what it’s for — something Dean did so well early in his presidential race — is what is desperately needed. Spreading fliers about a trivial political contribution from seven years ago is no more likely to grow the Democratic base out here in DuPage County than vilifying Republicans for simply being Republicans will do nationally. Your post today asks when FeedBurner will address the concerns you voiced here last month. As noted here (on FeedBurner’s public forums), and here on my blog more than a year ago (and here on my blog just a few days ago), this has always been how we encourage users to operate. It takes just a few minutes (as noted in the comments to my post) and protects the user entirely. If they’re ever not satisfied with FeedBurner’s service, they turn the redirect off. No problem whatsoever, we have no lock-in. Just trying to do exactly that. Let me know what else I can do to put this to bed. Update: Thanks to Dave for pointing to this post. Sorry if I communicated our intent poorly — I think our intent is pretty clear from our public forums where we document how to retain control over your feed. Ultimately, that’s up to the readers to decide. An old boss of mine, Randy Littleson, is part of the management team at manufacturing performance management company Kinaxis. They just relaunched the company (including a name change), their corporate website, and best of all, just started publishing new content in RSS. By running those feeds through FeedBurner, of course, Randy also gets metrics on how many people are subscribed to his feeds, reading his content, clicking through to the website — all important pieces of data that will help make the case internally that this is an important part of their web strategy. Ignoring the name of this blog for a moment (if you didn’t know, “tins” is an acronym for “There Is No Spoon”, a pivotal scene in the Matrix when Neo realizes that he’s in more control than he realizes, that rules are made to be broken), I’m actually not that much of a sci-fi fan. I hadn’t read Ender’s Game (had never heard of it, actually), and asked why he e-mailed me about it. “Seemed like you’d like it.” We left it at that, and haven’t revisited it since. When Audible turned on their RSS feeds (powered by FeedBurner, thank you very much), one of the titles that caught my eye was Ender’s Game. No idea why I remembered it from our brief e-mail exchange… but I did. Apparently there was a 20th anniversary edition, and after reading a bit about it, I was intrigued. Picked up a copy at the library a few days later, and dove in. Wow, was Marty ever right. Ender’s Game is the first book of a seven book series, The Ender Series. I’ve since read Ender’s Shadow (not a sequel, more of a companion to the first book, even though it was published fifth), and both are spectacular, riveting reads. I won’t give anything away — if you’re fortunate enough to not know anything about the story going in, you’ll thoroughly enjoy the ride that Orson Scott Card takes you on. The titles are listed as ‘young adult’ titles, which is surprising to me. I have no doubt that teens would love these stories, but they are equally fulfilling for adults. My wife is now racing me to see who can get through the books first (we’re now back on track in the order they were published: next up, Speaker for the Dead). Considering that Card first conceived of Ender’s Game in 1977 (when his short story was first published), his notions of the role of video games, networked information, and opinions expressed online are uncanny. Nearly 30 years ago he first wrote of the things that today we take for granted (but that even five years ago seemed novel): the Google library, blogs as opinion leaders, video games as military tutorials — he saw it all, and wove them together into a compelling combination of military strategy, politics, and the coming-of-age of a gifted and tragic leader. I’m hooked. Can’t wait to go deeper into Card’s world. Oh — and they’re working on the film. Type in “Redirect temp [path to your current feed] [url of your FeedBurner feed]” (again, no quotes). By way of example, my redirect reads: “Redirect temp /tins/rss.xml http://feeds.feedburner.com/tins”. After that, your webserver will redirect all incoming requests for your feed to FeedBurner. If you’re ever dissatisfied with FeedBurner (which we’ll take quite personally, I assure you), you just delete this file and go back to publishing your RSS feed at your public feed URL. As long as the redirect’s in place, you’ll now see aggregated stats on your feed — people who are subscribed to the feed at your domain as well as any who’ve subscribed to the FeedBurner feed directly. Hope this helps, let me know if you need any tips. More on .htaccess here. It’s an incredibly powerful tool (careful, with great power comes great responsibility…).